Posted by santos. This entry was posted on 20050422 at 10:59 AM You can skip to the end and leave a response. OMG. This is a matcha made in heaven! Why didn't I ever think of this? I think you should start a matcha club. I'll be matcha obliged to be the treasurer. I treasure all matcha products! I second AG, what a great idea! I can even taste how brilliant this is. you are genius! Not just added matha, but cointreau as well... brilliant. I've for ages meant to make orange tiramisu, never gotten around to it yet. hi OF! are you accepting dessert ideas for your bento challenge? i would love to see a norwegian tiramisu! hey chika--i have to admit, i got the idea from a disgusting cocktail i had the other weekend. in theory it sounded great--green tea, cointreau, and vodka--but in practice it was muddy and yucky. luckily not here! i'm looking forward to seeing your orange tiramisu one day, it sounds refreshing and perfect for summer. Wat a marvellous looking cake..! Yums..! It's so pretty! I keep seeing all these matcha things and have no idea what it's like. I assume I should be able to find it in an Asian grocery store... would it be with the teas? Maybe I should just find some on-line! Hi Santos! Thanks for another great idea! I can't wait to try it out once I get my hands on some matcha. Just to jump onto the "tiramisu bandwagon", here's my version of a coconut tiramisu or "coco-misu"? Dip sponge fingers in a sugar syrup spiked with Malibu rum. For the filling, chill a 140 ml/4 oz can of coconut cream, whip it (it won't expand much) and add it to the whipped cream. Or you can replace part of the whipped cream with it. If the filling is too runny, a little gelatine should hold it in place. Layer as usual and top with shredded coconut. Do try it out and let me know! So, so inspired! This is on my must make list for the weekend. Classic santos. Well conceived, well made, and well captured. I'm off to dream of mascapone and time. Hi Santos - I must try this, it looks so yummy... I like the idea of using matcha and orange flavour together. What a wonderful idea. I never thought of making tiramisu with matcha powder before. It looks so refreshing. Thank you so much for sharing! I'm going to have to try this sometime. hi julia! this was great, i'll definitely do it again. hi vivilicious! powdered matcha is difficult to find here too, but once you get a container it lasts forever. maybe you can get it through mail order or the web? hi mrs.t--i think you'd like it a lot! hi cathy--you should be able to find it with green teas in an asian store, but try to find a store that specializes in japanese products. although, i wouldn't be surprised if whole foods carries it. the problem is a lot of powdered green teas also contain sugar, so you want to avoid those. the web is probably your easiest solution. if i find i good web source, i'll let you know. jennifer--let me know how it turns out for you! hi keiko--i was also inspired by your (and chika's) tiramisu, i'll have to make one of those soon! hey reid--please do try this, it's really good. you can make small ones layered in a wine goblet or small glass for a different, individual presentation. Santos, I don't know whether to kiss you or to throttle you, I can't say no to that challenge, it's just too weird and too much fun, I accept!! Might take some time, but I'll let you know when it's done. (Head hung low) What have I done ;-). Ok, acceptance for your Norwegian dessert bento challenge is up on the right side bar of my blog. This ROCKS. I am a dud at making desserts so I will pester my sis to do this for me. I love it. ohmyGOD yum. i am so making this as soon as i can get my mitts on my canister of matcha back in boston. YUM! hey toni! always cool if you can get someone else to make this for you. foodnerd! i can barely keep up with your culinary adventures in chicago, they are so plentiful. i think you and tallasiandude will dig this. I saw your idea 2 months ago but I got matcha tea 2 days ago -after a little bit search of it/former i only heard and read about it- I tried your recipe! I think I should say I took the fantastic idea and made my own tiramisu recipe. I wanted to thank you for this orjinal tiramisu! This is so incredibly lovely! I am definitely going to try to make this. Yay! One question: what size dish should I be layering all this stuff in? Thanks for posting the recipe, and for keeping such a lovely blog in general. Just came across you in my web-hopping and I couldn't be happier! hi jenny! thanks for dropping by! i think i used a serving dish that was 9 inchesx13inchesx2inches for this one, but more often than not i make it in loaf pans and cake pans lined with plastic wrap (to make it easier to take out) before. Wow.. i never thing about this before. The best idea about green tea. interesting, because it's *not*. that in fact, is my recipe, which was a mash up of several different recipes i've used over the years. this is nobu's recipe. Then you need to contact recipzaar to have them correct their mistake and give proper credit. Sorry for the mixup. sw, thanks for directing my attention to this whole 'misapprehension'--i would have never have realized it otherwise. it seems rather odd that the person who posted it to recipezaar in the first place would have credited it to nobu matsuhisa when his recipe is online anyway. Hi. Your tiramisu does look pretty. I'm a Japanese American living in Tokyo. Macha is spelled 'macha' and the specific name of a dark green bitter powdered tea used almost exclusively in tea ceremony. The word for green tea is 'cha' or 'ocha.' There are many types. 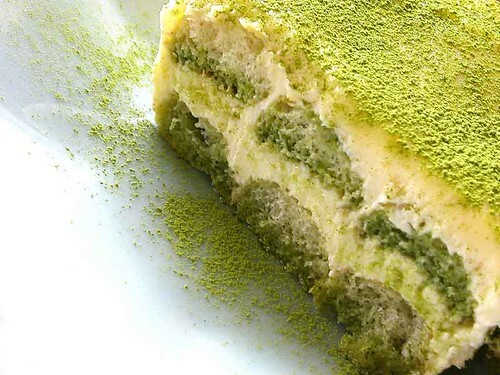 This green tea tiramisu was popular all over Japan in 1999 and Nobu was never recognized as its creator. I leave the eggs and caster sugar out of mine, using organic Swiss yogurt and powdered sugar instead with marscapone and cream. I think it tastes better and the texture is much nicer. It has the exact same recipe as yours, and I was wondering if somebody else just copied it without telling you. THought you might like to know. astriiluu, thanks for the heads up! i most certainly did not give them permission. ugh. down with the stealers! Hi Santos, I know this recipe is pretty old now so I hope you read this comment. I was wondering if my friend Kevin and I could use your tiramisu recipe and photo on our matcha website, it looks great. hello there :) would you mind telling me how much tiramisu this makes? (7/8/9 inches?) Thank you for your time. hi astriluu! i used an 7-inch mold, but i had leftovers. you could probably make even a 9-inch one. thank you so much! I made it today and it was DELICIOUS. I used an 8 inch pan and it fits just nice. =) Awesome recipe.